This highly prized Alpine Sweet Wormwood has been cultivated at a high altitude to be rich in absinthin and anabisthin, without extreme bitterness. A premium grade wormwood that is produced by combining two species: Artemisia umbelliformis and Artemesia absinthus - this rich herbal product has the best of both types. Wormwood tea can be made by adding 1/2 to 1 teaspoon (2.5 to 5 grams) of the herb to 1 cup (250 ml) of boiling water, then steeping for ten to fifteen minutes. Many doctors recommend drinking three cups (750 ml) each day. * It is recommend that it should not be used consecutively for more than four weeks. The earliest account of wormwood use dates back to ancient Egypt. The herb Wormwood is forever married with the famous liqueur of Europe the "green fairy" Absinthe. The word absinthe comes from the Greek word apsinthion, which means undrinkable (Lanier 1995), which describes its extremely bitter taste. The bitterness is due to the chemical absinthin, one of the components of wormwood, that has a bitterness threshold of 1:70000, which means that one ounce of it can be detected in 524 gallons of water (Arnold 1989). This plant grows wild all over Europe and the US. 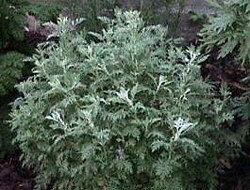 The bitter component of wormwood is an alkaloid, absinthin, which is separate from the essential oil, thujone. Thujone is has a long history of use with artists, but it can be highly toxic in large quantities.